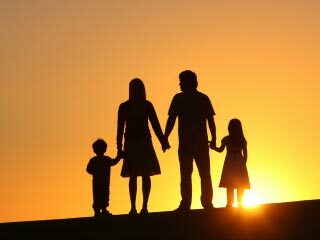 I would like to share a few thoughts on the subject of family life – family life in general and your family in particular. If you go back into history, you will find there probably was never a time when family life was thoroughly at peace. From Adam and Eve to Cain and Abel and even to the hardships of the first holy family, family life has always been assaulted. If you read the beautiful works of the historian Arnold Toynbee, his thirteen volumes make it very clear that if the nineteen civilizations that have existed since the beginning of recorded time, sixteen of them have crumbled from within because basically the family life broke down. If you jump over many centuries to the time of Charles Dickens, you soon read that family life in England with children being forced to work to help their families survive, it certainly was not a happy time. When you think of the millions of immigrants that came from all over the world, separated from their families to start a new life in a strange country, it is easy to read between the historical lines. When you come right down to the depression years in our country, family life has been assaulted. And it is still being assaulted. No one ever figures that they might be part of a sad statistic that you might read in some text book. For example, we know it is a tragedy when young people in particular commit suicide, but we now know the number of young people attempting suicide has quadrupled in the last ten years. Years ago, one out of every ten father's left his fatherly obligations and the wife was left on her own. Now it is one out of every four. And so for parents and for children you could never take your family for granted. You can never think that what has happened to others might never happen to you. Every parent has to provide not only a home, but emotional stability, family stability and financial stability. Every parent has to recognize that there is one thing that has to be done for children. That is the act of quality time for parents to listen to what their children's observations might be. What does listening do? Listening gives the person a feeling that he is not going to get a lecture on what he is talking abut. Listening gives a person the opportunity to ventilate his grievances without a sermon coming. Listening gives a person the possibility of freeing his mind from the problems that are so confusing and so bewildering and once listening has taken place a catharsis is experienced that releases the person of the mental burden that he is carrying. Basically when listening is done correctly, the teenager or adult is going to be more receptive to what you are going to say. There is a definite correlation between being a good listener and a good leader. Listening on the part of both parent and children is so definitely needed. To the young people of today, if you ever study psychology you might remember the Sigmund Freud once said, being a parent even in the most ideal of circumstances is an impossible vocation. There is no doubt about it, years ago we never grew up in the drug culture you are growing up in. Years ago we never had as many scandals as you now have seen in newspapers and televison. Years ago, people had a sense of dedication and devotion to their family. That sense of dedication developed a sense of loyalty. Your family's reputation was sacred. You never desecrated the good name of your family and responsibility and obligations according to your age had to be honored. There is no such thing as a free lunch in or out of home. To the young people, ask yourselves, are you doing enough to protect your own family? No one needs your bad moods, no one needs your surly remarks. If you don't have the charity of Christ in your personality and manifest it in your tongue and speech, you are doing an injustice to your family. The last quality that teenagers have to develop is a sense of devotion. There is nothing really preventing you from offering one hour a week to God by attendance at Church. You have an obligation spiritually to pray for your family that they may never become one of the sad statistics that are ruining so many families. So, when you look at family life today, you have to recognize that each one of us has an obligation, each one of us has a responsibility. Your family can never become a sad statistic and you have the opportunity by the way you live at home, to give honor and glory to your family and honor and glory to God.